The Four toed salamander is a medium sized amphibians the reach 5 to 10 cm and is part of the Plethodontidae family of amphibians, the lungless salamanders. It is red to brown in colour with gray sides and a white belly black-dotted belly and an orange tail. In the wild they can also be confused with Redback Salamanders but there belly is lighter in colour. The Four-toed salamander have a flat and short head with eyes that seem to pop-out their heads. These amphibians have short legs and has there name illustrate, they have four toes on each foot. These salamanders have a distinct characteristic among amphibians, there tail can break up if seized by a predator due to it constricted base. Generally males are smaller than females and have longer tails. 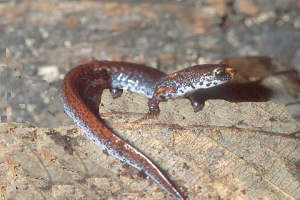 In Canada, the four toed salamander is unevenly distributed from Southern Ontario where it is particularly common in the Georgian Bay region of Lake Huron, to southern Quebec and there is also distinct populations in Nova Scotia. Another characteristic that make them a bit special among Canadian’s amphibians is the communal nesting strategy they use to protect their eggs from predator and other amphibians. Four-toed salamanders also use a communal strategy to hibernate under rotting logs of leaf litter with other Four-toed salamanders but also with other amphibians species such as spotted salamanders, red-spotted newts, Jefferson salamanders and wood frogs. The four-toed salamander is a nocturnal salamander that hunt for insects under stones, wood, leaf litter, and moss in bogs and marshy wetlands. Adults prefer hardwood forests, while the larvaes lives in water pools with a lots of sphagnum moss. Therefore, this salamander is restricted to areas where these two habitats occur in close proximity. Four toed salamanders mate in terrestrial areas throughout the fall months. In early spring lay the eggs on land in their communal nests along the banks of small ponds. After the 4–6 week before hatching. After the eggs hatch, the larvae migrate to the water and stay there for about six weeks, but in cold temperatures larval development can last as long as 5 years. This behaviour is unique because other salamanders with a terrestrial nest lack an aquatic larval stage. After, juveniles return to land to transform into adults. The average lifespan for adults four toed salamander is around 3 years in the wild. Even though it’s rarely seen the COSEWIC (Committee on the Status of Endangered Wildlife in Canada) does not consider four toed salamanders to be at risk in Canada. But according to IUCN ( International Union for Conservation of Nature) it is at risk in Quebec province where is rarely seen..